Unfortunately this is quite difficult. My memory of rolling up to a Maher Cup match was of a ticket seller at the gate with a bookmaker’s bag taking cash and dispensing tickets. There were no turnstiles to tally the mob. Newspaper normally reported “the gate”, that is the total value of the tickets sold. Those that didn’t pay, like school children and in some cases ladies, were not included. Journalists would often estimate the size of the actual crowd – but to the nearest 500 at best. Sometimes these estimates were wildly exaggerated. For example the 19 August 1931 match at Young vs Temora and the 23 August 1952 game Gundagai vs Cootamundra were both reported to have attendances of 8000, where the gate income would indicate 4000 and 5000 respectively to be more accurate. Admission charges increased through the years – 6d in 1920 to 3/6 in 1952, varied between grounds, and were often adjusted according to how much the punters were willing to pay for a particular attraction. 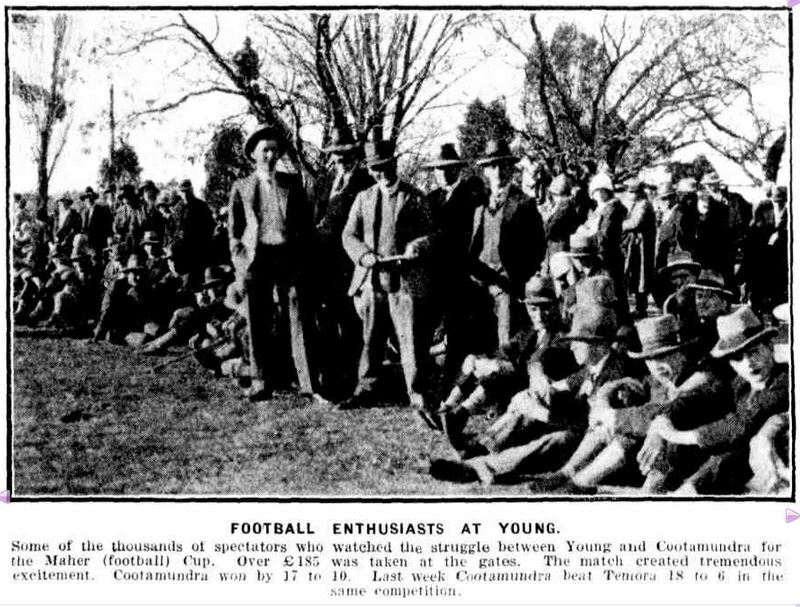 In 1925 Wyalong not only shocked Cootamundra by wresting the cup away, they also shocked the hundreds of Coota supporters who travelled the 81 miles to West Wyalong on 23 September to take it back, by slapping on a one-off 2/- charge. Cootamundra in 1928 doubled the price against a superb Canowindra side. In the early years only men paid, or women were given at least a discount. School children were usually allowed free entry. At Gundagai in 1922 (see above image) school children got in for free, but children over 14 were considered to have an income and were charged 6d. For those lucky enough to come by car there usually was some charge for parking around the oval. The match takings, which included the sale of match programs, was technically different from the gate – but the distinction was usually lost in reports. The levying of entertainment tax contributed to the confusion. So, given the daunting challenge presented by this multitude of variables, below is my first attempt to make a top ten list. Undoubtedly it will be refined over time. Gate: £871 at 3/- , estimated 5,810 paying spectators. 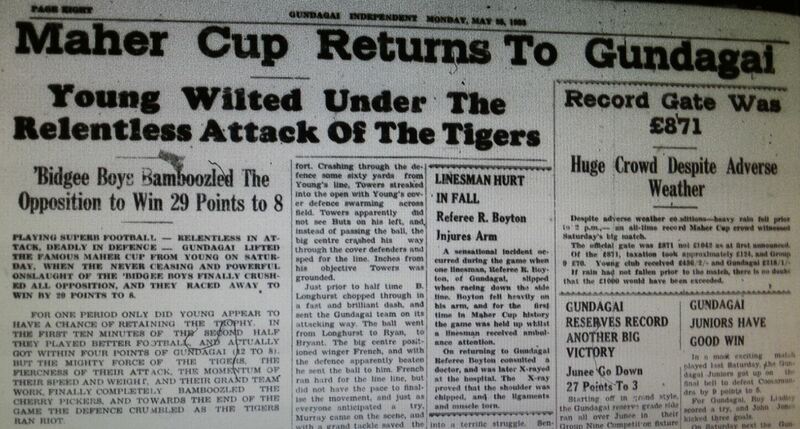 The Gundagai Tigers of the early 1950s were one of the greatest Maher Cup teams, winning 24 matches straight before a shock loss to Grenfell in the last game of 1952. This game was the first opportunity Gundagai had to recapture the Old Pot. Fullback: Jack Murray. Three-quarters: Jack Bond, Ian Johnston(c), Neville Brogan, Ron Murray. Five-eighth: P. ‘Buster’ Harvey, Half: John Scott. Forwards: Peter O’Connor, Allan James, Ray Green, Sid Hobson, Brian Jeffrey, George Robertson. Fullback: Len Koch. Three-quarters: Paul Butz, Wally Towers, Ralph Bryant, Norm French. Five-eighth: Brian ‘Bill’ Longhurst. Half: John Ryan. Forwards: Bob Henery, Owen Hourn, Noel Goodsall, Nevyl Hand(c), Harry Gibbs, Terry Brogan. Referee: M.Ibbotson. Linesmen: L. Boynton (Gundagai), F.McGuigan (Young). Gate: £743/4/6 at 3/6; an estimated 4243 paying spectators. Gate: £742/16/- at 3/6; an estimated 4240 paying spectators, and crowd of over 5000. The Temora Independent of 24 May estimated the crowd at “nearly 10,000” with the gate just £12 short of the above Young v Gundagai match (taking into consideration that the entertainment tax was abolished on 1 October 1953). The newspaper claimed almost 5,000 paying spectators and about 5,000 non-paying children. Gate: £211 at 1/-; an estimated 4220 paying spectators. But gate also given as £179 by the Cootamundra Herald. Young v Temora : 19 August 1931. Almost £200 probably still at 1/-, or almost 4000. 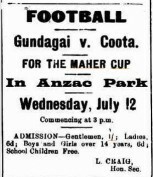 Gundagai vs Cootamundra : 10 May 1952. Gate £615 at 3/6 or 3515. Tumut vs Cootamundra : 16 August 1947. Gate up to £343 at 2/- or 3430 paying spectators. This entry was posted in Matches and tagged Crowd Statistics. Bookmark the permalink.